I don't have much to say today. 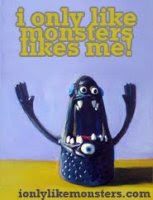 Happy Friday the 13th... International Monster's Day and just plain old TGIF. Here are some cheerful pictures! Oh! And guess what else? The four original yetis are up for sale on my etsy shop. Check it out!